Premium Compatible Label Tapes for the Brother P-Touch 1080 printer. The Brother P-Touch 1080 is a versatile handheld label printing machine that prints fine quality labels ideal for a variety of purposes in offices as well as home. The machine offers a variety of label printing possibilities enhanced by functions like flexible tape options and Deco Mode patterns to print high quality labels, which raise its quality and functionality. The overall impact is raised all the more when it prints Brother P-Touch 1080 Label Tapes. 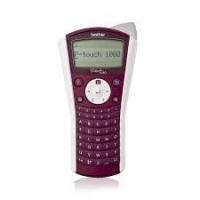 Brother P-Touch 1080 has a sleek design which makes it easy to operate. Its makers have taken the effort to make it an affordable device so customers can look forward to saving big and yet get best quality and performance. It prints labels that last really long and can be used for a variety of purposes such as labelling objects like CD covers, children’s stationery articles, office equipment, storage boxes in kitchen and more. Brother P-Touch 1080 Label Tapes guarantee durability and optimal performance when used with Brother P-Touch 1080 as they have been put through stringent tests. As for other aspects of Brother P-Touch 1080, it features the ABC keyboard layout, prints at a speed of 10 mm/sec and features print resolution (dpi) of 180. The maximum print height it reaches is 9mm and furnishes 12 characters x 1 line display on the screen. The machine weighs 290g and has 108 mm (W) x 209 mm (H) x 58 mm (D) dimensions. Its tape type is TZ / TZe and gels most favourably with Brother P-Touch 1080 Label Tapes. The Brother P-Touch 1080 is ideal for office, commercial as well as home use. It offers versatility and high quality functions that users across segments need. However, if this label printing machine had an automatic cutter and bigger print size, it would’ve been a definite best seller. Q. Will a P-Touch 1090 labelling tape fit and work in a P-Touch 1080 labelling machine? A. It may be possible that some of the P-Touch 1090 labelling tape fit and work in a P-Touch 1080 labelling machine. We advise you to look under your specific printer model number and bring up a list of the correct supplies. Q. Stripes appear on my label. Why so? A. If stripes appear on your labels, it means you have reached the end of the Brother P-Touch 1080 Label Tape. Replace the tape cassette with a new one. Q. The ink ribbon got caught in between the Brother P-Touch 1080 Label Tape layers and came out of the machine. What should I do? A. This happens when you install the Brother P-Touch 1080 Label Tape cassette leaving the ink ribbon loose or by pulling the printed label out by hand. You can wind the toothed wheel and reel the ink ribbon, if the ink ribbon does not get separated from the cassette. Make sure to wind the toothed wheel in the correct direction. If the ink ribbon has become separated, you cannot roll the ink ribbon. If the problem is still not resolved, replace it with a new tape cassette. Q. How do I print multiple lines in Brother P-Touch 1080 Label Writer? A. Move the cursor to where the second line starts and press the Enter key. A return mark will appear. This way you can print multiple lines in Brother P-Touch 1080 Label Writer. Q. How many text lines can be printed from Brother P-Touch 1080 Label Tape? Q. Why does the power turn off when I press the print key? A. This happens because the batteries are running low. Replace the batteries with same type of six new AAA (LR03) alkaline batteries. Q. The Brother P-Touch 1080 Label Tape does not cut well. What can be done? A. If the cutter blade becomes blunt after repetitive use and the tape cannot be cut cleanly, replace with new cutter unit. Q. What can I do with the File function? Continue pressing the ‘F’ key or press the ‘left arrow’ or ‘right arrow’ key until ‘File’ is displayed. Then press the ‘Enter’ key. Press the ‘left arrow’ key or ‘right arrow’ key until ‘Save’ is displayed. Then press the ‘Enter’ key. Choose the memory location that you want to store the label to (number 1-9), and then press the ‘Enter’ key. Q. The fabric Brother P-Touch 1080 Label Tape became detached after washing. What should I do? A. The adhesive force of the fabric tape varies depending upon the ironing temperature, ironing procedure and fabric materials. For ironing, set the iron to a medium-high temperature. Press down firmly for 15 to 30 seconds. The suitable materials are cotton, linen and polyester. Q. Why does my machine display "Text Lmt"? Change the Margin setting to ‘Narrow’ or ‘Half’. Change the Length setting to ‘Auto’. Reduce the size of the characters.